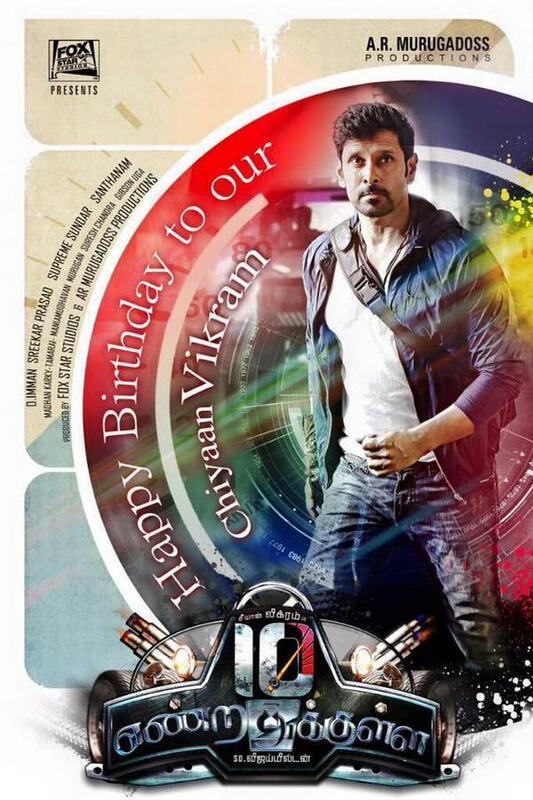 As expected, the first look of Vikram starer '10 Enradhukulla' unveiled at 12AM i.e. April 17th, 2015 on the eve of Vikram’s birthday. Wishing a very Happy Birthday to Chiyaan Vikram, the first look poster of his forthcoming Tamil movie 10 Enradhukulla has been launched in the midnight, in which Vikram looks super stylish. The first look poster is innovative with colorful design. Gorgeous actress Samantha plays the female lead in this movie and she will be seen playing a dual role. 10 Enradhukulla is touted to be a road thriller. Makers are planning to release the movie in June. Directed by Vijay Milton under AR Murugadoss Productions, Fox Star Studios presents 10 Enradhukulla. Music is by D Imman and editing is by Antony among the crew. Born on 17 April, 1966, 48-years-old Vikram has entertained Tamil, Telugu, Malayalam and Hindi audiences with his phenomenal performances in about 49 movies and gearing up for the release of his trade mark half century. Post his Shankar's magnum opus I, Vikram's 10 Enradhukulla marks his 50th film in his career, which is slated for May release.